1. Open a new checking account in an eligible account package by 3/31/2015. 3. The miles will be posted within 90 days from the statement close date of the month that all the qualifying activity is met. This will be important (read below). 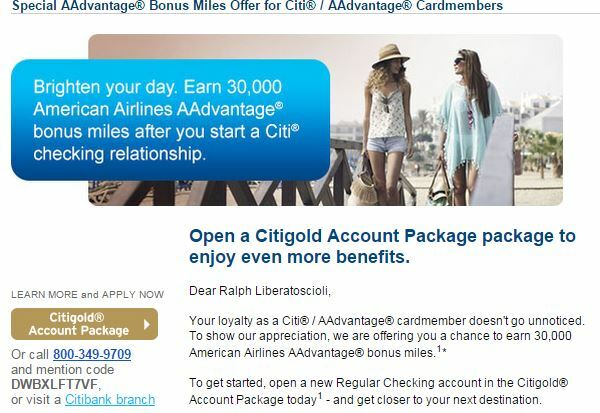 In the past I’ve seen offers for earning AA miles in other types of Citibank checking accounts but this promotion is only for Citigold accounts. Here is a snapshot of the requirements and fees of the Citigold account. Additionally, here is a summary of the various accounts on Citibank’s website. Once the miles post, I would call Citi and ask to downgrade to the account in which I could safely meet the requirement to get any fees waived. There is nothing in the fine print that states how long an account has to be open so I interpret this that once the miles post, they will not be taken back if I downgrade or even close the account. If I can’t downgrade the account, I would simply close it once I see the miles post. If you are not interested in AAdvantage miles, there is also a similar offer for 40,000 Thank You Rewards points. While I prefer the AA miles over Thank You Rewards points, Doctor of Credit has a good writeup of that offer here and that offer might make more sense for some of you. For those wondering about Citibank issuing a 1099 for the value of the miles, I thought Citibank stopped issuing them in 2013 so this shouldn’t be an issue. Maybe others in the comments can verify their experience. ← Award Trip Breakdown: MLK Weekend in Aruba and an Escape from the NY Winter! I’ve done this a few times over the years and Citi waives the monthly fee automatically for the first 2 months making this even better! I had a Citi checking acct that I closed in Dec. It was basic, not Citigold. Will this make me ineligible to get the bonus? The terms do say for new checking customers only. Not sure when you are considered new again. Anyone else know? Whey applying for the Citigold account, does this result in a pull on your credit score? I have the AAdvantage Executive card, do I need to “sign in” as a customer when filling out the application or simply enter the code and proceed to the next page as a new customer? Thanks! There is only a soft pull so no hit to your credit score. I didn’t sign it with my account and just filled in the code. I think the benefit of signing in only helps speed up the application since it can pull your info from your account. Thank you, last question! I entered the code you provided and successfully opened the account this morning. I did not see anything along the way that detailed the 30,000 mile offer. Do I need to call Citi to make sure it’s applicable to my account? I don’t want to go through the work if I’m not going to get the miles in the end. Ya it’s always a good idea to call and confirm your account has the promotion attached to it. Do you know if using the debit card to load Redcard/Serve/Bluebird would be considered qualifying purchases with this offer?